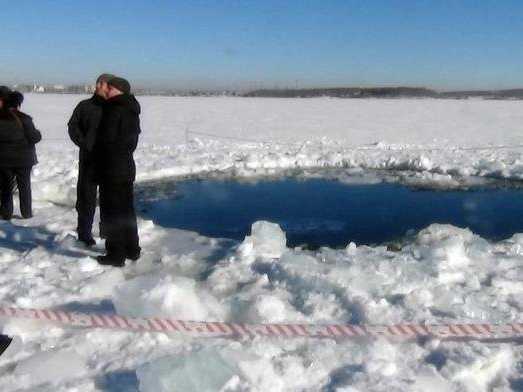 Divers scoured the bottom of a Russian lake on Saturday for fragments of a meteorite that plunged to Earth in a blinding fireball whose shockwaves injured 1,200 people and damaged thousands of homes.The 10-tonnes meteor streaked across the sky in the Urals region on Friday morning just as the world braced for a close encounter with a large asteroid that left some Russian officials calling for the creation of a global system of space object defence. The unpredicted meteor strike brought traffic to a halt in the industrial city of Chelyabinsk as residents poured out on the streets to watch the light show before hovering for safety as a sonic boom shattered glass and set off car alarms. The shattered glass injured most of the people. “We have a special team working… that is now assessing the seismic stability of buildings,” Emergencies Minister Vladimir Puchkov told residents as he inspected the damage in the central Russian city. A fragment of the meteor — called a meteorite once it hits the ground — was believed to have plunged into the Chelyabinsk region’s frozen Lake Chebarkul. “A group of six divers will inspect the waters for the presence of pieces of a meteorite,” an emergencies ministry spokeswoman told Russian news agencies moments before the start of the operation. But Puchkov stressed that no fragments had been discovered anywhere in the region so far despite some 20,000 rescuers and recovery workers being dispatched to the region on Friday. Scientists at the US space agency NASA estimated that the amount of energy released from impact with the atmosphere was about 30 times greater than the force of the nuclear bomb dropped on the Japanese city of Hiroshima during World War II. The drama in Russia developed just hours before an asteroid — a space object similar to a tiny planet orbiting the sun — whizzed safely past Earth at the unprecedented distance of 17,200 miles (27,000 kilometers). “Instead of creating a (military) European space defence system, the United States should join us and China in creating the AADS — the Anti-Asteroid Defence System,” the close ally of President Vladimir Putin wrote. NASA estimates that a smallish asteroid such as the 2012 DA 14 flies close to Earth every 40 years on average while only hitting the planet once every 1,200 years.